LupinRanger VS PatRanger Super Battle DVD- “Girlfriends Army” Announced! Toei has announced a new TerebiKun SuperBattle DVD special episode for the current Super Sentai series- Kaitou Sentai Lupinranger vs. Keisatsu Sentai Patranger! 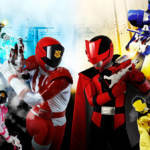 This SuperBattle, titled Girlfriends Army– features a teamup between two of the Rangers- Umika/ Lupin Yellow and Tsukasa / Patren 3. Exact story details for this adventure are sadly unrevealed at time of writing. Girlfriends Army is currently scheduled for release on June 30 2018! Stay tuned to TokuNation as we keep you up to date on all Super Sentai news! 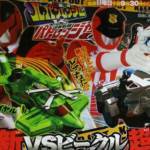 LupinRanger VS PatRanger March Scans Online- Cyclone DialFighter & Trigger MachineBiker Join The Battle! With the latest round of magazine scans hitting the Internet, it is time to see what lies ahead for Kaito Sentai LupinRanger VS Keisatsu Sentai PatRanger! *Not to be left out, the PatRangers’ receive a new TriggerMachine for combat- the TriggerMachine Biker! This blue motorcycle links with PatKaiser to create PatKaiser Biker and allows the Mecha to strike enemies from a distance with a gigantic YoYo. Interestingly, the scans appear to show each team using THE OTHERS’ new machines at one point- suggesting there may be some collaboration in the future between the police and the thieves! Last but not least, a new Gangler villain will be joining the show- Zamigo Delma is a mysterious figure with a dark connection to the LupinRangers’ past. Definitely some exciting times ahead for the 42nd Super Sentai Series! Stay tuned to TokuNation as we keep you up to date on all LupinRanger VS PatRanger reveals! 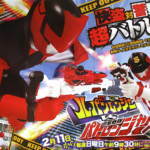 Kaitou Sentai Lupinranger VS Keisatsu Sentai Patranger is about to enter it’s third week. So continuing our coverage of the merchandise released so far, we’re revisiting the show with 3 more entries in the Sentai Hero Collection line of vinyls. Lupin Red, Lupin Blue, & Lupin Yellow! 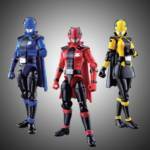 As with the Patrangers these Hero Collection vinyls offer an affordable option for you to own your favorite characters that may not necessarily receive figures in other toylines. In many cases these vinyls offer 1 of few, if not the only option for you to collect a particular hero. That was what drove me to pick them up myself. The Lupinranger designs are very slick, if a bit more limited in this line than your average release. Vinyls may not do much, but as static display pieces they get the job done. 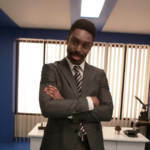 Be sure to go back and check out our Patrangers gallery as well! We’ve attached over 35 images to this post, but you can also check out the full review after the jump. Just click “Discuss on the TokuNation Forums” at the bottom of this post. Next time we’ll be back with the formula for victory with a gallery from Kamen Rider Build! First Round Of LupinRanger VS PatRanger Magazine Scans Online! The release of the 42nd Super Sentai Series draws ever closer, and some new magazine scans have been posted online to give us the best look yet at Kaitou Sentai Lupin Ranger VS Keisatsu Sentai Patranger! *The GoodStriker that is central to both teams’ abilities is in fact a sentient device that chooses which team it wants to work with. When used by LupinRed the GoodStriker grants the ability to create clone soldiers. When used by Pat 1, the GoodStriker will fuse all 3 PatRangers to create PatUGo! *GoodStriker becomes the central torso in both teams’ Mecha combos. As LupinKaizer the LupinRangers can attack with tremendous speed. As PatKaizer, the PatRangers will strike with tremendous force. *The mysterious Lupin Collection will be central to most fights. Each Treasure has a unique effect, which can be unlocked by the Rangers OR the mysterious Gangler creatures. *The Ganglers’ foot soldiers are known as Porderman and can hide in human form to hunt for the Treasures. LupinRanger VS PatRanger is currently scheduled to begin on February 11 2018! Stay tuned to TokuNation as we keep you up to date on this exciting new series! 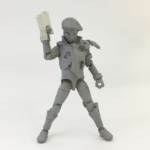 As Super Sentai fans are well aware, Bandai Japan does not make a habit of releasing anything other than vinyl figures for the Super Sentai heroes. However, that trend looks to be changing. Uchu Sentai Kyuranger saw the release of Yu-Do candy toys – articulated figures that, well, you put stickers on. That is continuing with Patranger vs Lupinranger. Thanks to Bandai Candy we have our first look at the Yu-Do Patranger vs Lupinranger Candy Toy Figures! All three Patrangers and all three Lupinrangers will be released as well as a number of accessories for them (including swappable hands!). A number of changes from the Kyuranger version also look to increase the stability and overall look of the figures. We’ve mirrored a majority of the product images here so click the title of the story to check out all of the Yu-Do Patranger vs Lupinranger Candy Toy Figures! 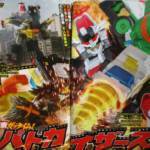 Last week we saw the first official image of the upcoming Patranger vs Lupinranger Mini-Pla version of Lupin Kaiser. Today, we have official images for everything in the first series from the Mini-Pla release. Click the title of the story to see all the images of the Patranger vs Lupinranger Mini-Pla Vs Vehicle Series Series 01. Special thanks to neoxul of the TokuNation forums for the heads up. 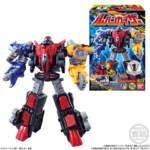 Mini-Pla are miniature versions of your favorite Super Sentai mecha in model-kit form. You literally build it yourself and apply stickers (or paint if you’d like) to create a smaller, articulated version of your favorite Super Sentai mecha. If you’re not thrilled with the articulation of the large DX Mecha, definitely consider giving the incredibly affordable Mini-Pla a try! Patren 2- bright, obedient & totally dedicated to hunting the LupinRangers. Patren 3- caring “older-sister” type to the team, not certain if the Lupins are true enemies. Yoichi Nukumizu as “Kogure,” descendant of the legendary thief Arsene Lupin who aids the LupinRangers.